At Down on the Farm we will have hot and cold food available. Drink will be equally diverse with a range of ciders and perries which are brewed on site alongside a full bar of ales and there will be spirits available too. Also in our coffee shop, tea and coffee are of course standard. You are not permitted to bring your own food and drinks into the festival site and you will be asked to leave if found drinking and eating your own. Please understand that we have to do this to keep the festival running at a reasonable price for you. You may consume your own food and drink in the campsite field only. We welcome kids of all ages to Down on the Farm this year. Kids aged 5-11 will require a child ticket and kids 4 and under do not require a ticket. Anyone aged 12 and over requires an adult ticket. Naturally, we ask that all children under the age of 18 are supervised.Please note that some acts at Down on the Farm 2017 may be unsuitable for children and may feature material not suitable for children that we are unable to predict and classify due to the nature of live performance. Tickets are available through Music Glue in the form of e-tickets which will be emailed to you. You must print this off and bring them with you so they can be scanned upon entry to the festival site. Tickets are NOT sent out in the post. There are limited tickets of just 400. Tickets for children under 12 are half price and under 4’s go free. For everyone else aged 12 and over must purchase a standard adult ticket. Tickets will be on sale on Music Glue till Midday Friday 11th August after that the remaining tickets will be put on the gate to purchase on the day. Please be aware we are CASH ONLY on site. 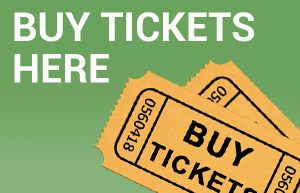 For more information on tickets and where to purchase go to the ticket page. If you wish to camp you must purchase a Weekend Tickets. On entry you will be issued with a wristband – this is your proof that you have been permitted entry. The wristband remains the property of Down on the Farm, until the end of Down on the Farm 2018. You must not tamper with the wristband or allow it to be tampered with. If the wristband has been tampered with or you are found to be not wearing a wristband then you will be removed from the site. It is your responsibility and you must guard your wristband with your life! Official merchandise will be available on site. The campsite will open at 1400 hrs on Friday and will close at 1300 hrs on Monday. On Saturday and Sunday the gates open at 12 noon and the bands start at 1pm and all music runs through till midnight each night. From Hereford take the A465 towards Abergavenny, after approximately 6 miles turn right on the B4348 towards Peterchurch and Hay-on-Wye (Petrol station and shop on this junction). Follow the B4348 for 6 miles and then turn left on to the B4347 signposted Abbey Dore and Pontrilas. (Brown sign marked “Gwatkins Ciderhouse” on this junction) We are just over a mile along this road on the right hand side. From Abergavenny take the A465 towards Hereford. Follow the A465 for 12 miles and then turn left on to the B4347 signposted Hay-on-Wye ( Also brown sign for Dore Abbey and Abbeydore Court Gardens on this junction) . Follow the B4347 for 5 miles through Abbeydore village and on towards Vowchurch/Peterchurch and Gwatkin Cider and the festival site can be found on your left. From Hay-on-Wye take the B4348 signposted Bredwardine and Peterchurch. After 2 miles turn right on the B4348 signposted Ross/Dorstone/Peterchurch. Follow this road for 9 miles through Dorstone, Peterchurch and Vowchurch. Then turn right on to the B4347 signposted Pontrilas/Abbeydore (Brown sign marked “Gwatkins Ciderhouse” on this junction). 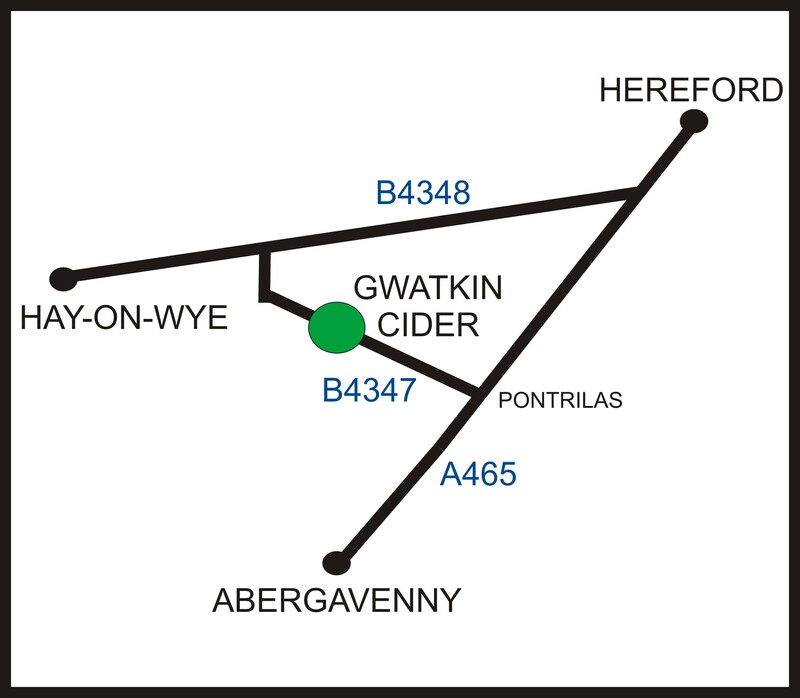 Follow the B4347 for just over a mile and Gwatkin Cider and the festival site can be found on your right hand side. Buses run Hereford to Hay (number 39) and Hereford to Abergavenny (number X3) but we are located on a minor road not on a bus route. The number 39 bus stops at Peterchurch and Golden Valley Taxis (01981 550434) are based there to complete the journey to our farm. The X3 bus stops at Pontrilas but that is still 6 miles from our farm! Parking at Down on the Farm is included in your ticket price and there is space for camper vans and caravans. Camping is included free of charge when a weekend ticket is purchased. 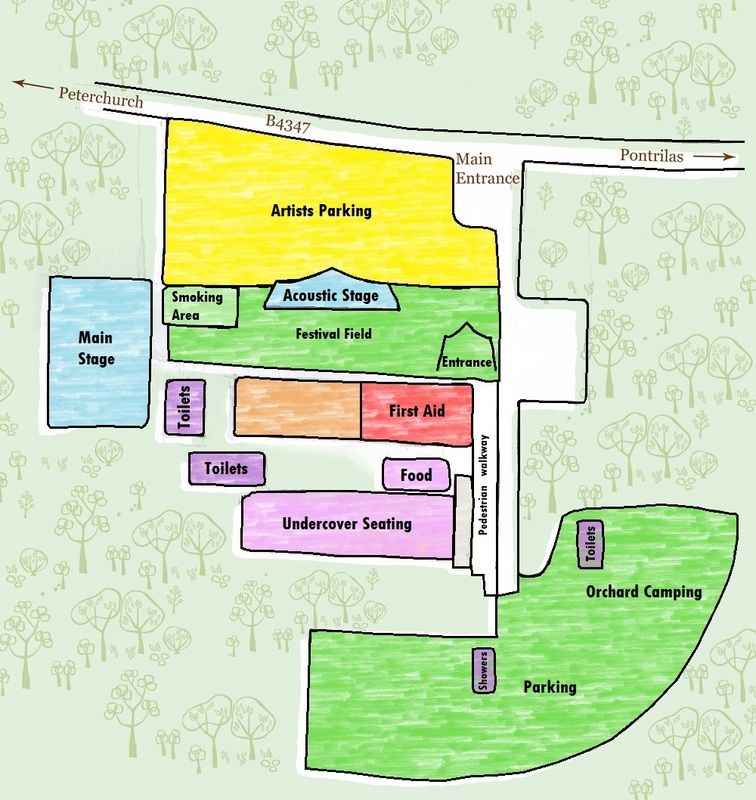 The campsite is situated only a minutes’ walk from the festival site. Toilets and showers will be provided on the campsite. You may park your car by your tent but for safety reasons you will not be able to move it between the hours of 9pm and 8am. If you wish to move your car at any point between 8am and 9pm please contact a member of staff to assist you safely. If you do wish to use your car regularly throughout the weekend it may be advisable to park in the car park which is in the same large field as camping so not far to walk at all. We do allow dogs on site but they must be on a lead at all times and you must clean up after your dog. Please under no circumstances are there to any fires in the campsite. However small BBQ’s will be permitted as long as they are raised off the ground. Please make sure all rubbish is put in the bins provided and that your campsite area is clear before you leave. Please remember this is a working farm so rubbish left behind could have an impact on the farm animal’s wellbeing. Remember – smoking is not permitted in any enclosed public spaces or buildings/barns. A festival is no different.